Kitten Instinct was the first serious venture into stop motion for all of us key crew members. It already took more than half of our planned two-year production to devise puppets, sets, and cinematographic methods that were satisfactory in both visual design and functionality. With a looming deadline it was our priority to start shooting as much visual material as possible, not worrying about sound just yet (some essential narrative threads were of course already planned, like the purring of the piece of wood and T-Rex learning to meow and hiss). Composer/musician/sound-artist Simon Halsberghe knew what he was getting into from early on, but didn’t get closely involved until we had shot about the first half of the film, compiled it into a rough edit and felt confident that we could finish the shoot in time. Still, most of the creative decisions regarding music were handed over to Simon himself. We knew we needed some kind of main theme and we knew we wanted sound textures that felt somewhat alien, belonging to a prehuman world, so faraway in time that it would forever remain mysterious. Beyond these requests and a rough edit+animatic of the film as reference, we gave Simon free reign. The zip package with audio files he sent us a few weeks later was pretty much the album as it can be downloaded today from Gentletapes’ bandcamp page and as it appears in the film. The modular synth sounds were perfectly otherworldly, while still subtly hosting the warm familiarity of what seem to be electronically simulated purring, hissing, meowing and roaring. Even more importantly, the compositions themselves perfectly reflected the emotional trajectory of the story and characters. While the sounds’ textures are appropriately fantastical and alien, they are applied in themes and melodies accessible and evocative to audiences who aren’t necessarily accustomed to “abstract” music. As such the soundtrack retells the film musically, highlighting the dramatic chapters of the story and the mental trajectory of the T-Rex. This might seem like the basic definition of a film soundtrack, but many scores “merely” accentuate or amplify the leading actions onscreen, rather than forming an entire new layer of cinema. When the music files arrived we had just finished shooting the essential parts of the final battle between T-Rex and Allosaurus. Simon hadn’t seen these shots yet, just as we hadn’t heard the music for them, but as soon as we brought image and sound together for a first test, it lined up pretty much seamlessly. Simon had composed the timing and the rhythm of this scene in sound identical to but independently from our animation. Simon created the music using Roland Sh-101, Elektron Analog Rytm, Moog Sub 37, Eurorack Modular System (Make Noise, Endorphin.es, Mutable Instruments, Intellijel, Noise Engineering) & Omnisphere . It won the award for Best Soundtrack at the Premiers Plans 2017 film festival in Angers, France. 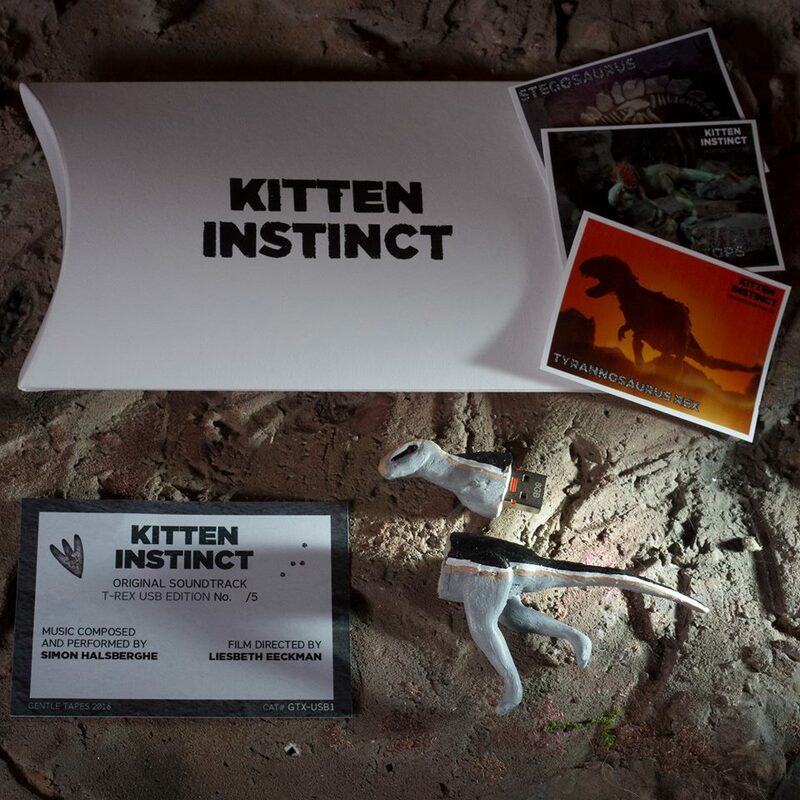 The digital release of the soundtrack album is available on https://gentletapes.bandcamp.com/album/kitten-instinct-o-s-t . If you liked Simon’s work in the film and are feeling adventurous, be sure to check out his album Mourn The Fleeting Moment or the heavier stuff he’s released on BXL Recordings.